The best way to become inhumanely strong is, of course, by adopting strength training as your primary fitness activity. If you have a very busy life, just like most people today, you probably don’t have a lot of free time to spend in the gym, and we are pretty sure you would like to find a way to make maximum strength (and size) gains in the shortest amount of time. Strength training can be incorporated into your workout in many, many ways, but not all of them produce top results. For example, boxers and wrestlers usually have custom-tailored strength training routines which help them constantly improve their performance. “Regular” bodybuilders and fitness enthusiasts, on the other hand, are often left to try out different ways to merge their size and strength goals until they hit the jackpot. Which, as you may already know, takes quite a serious amount of time! And we’d like to help you achieve your goal much, much faster. What are the best exercises for gaining strength while maintaining weight? What do top athletes do to help develop their strength? Are you interested to know the truth? Read on! The most popular (and theoretically sound) definition for strength says: “The maximal force that a muscle group can generate at a specific velocity” (Beachle and Earle 2008). Therefore, literally everyone, including our grandparents, can benefit from getting stronger. However, when speaking about athletes, we believe that becoming as strong as you look like should be obligatory for all! Powerlifters and Olympic lifters have strenuous strength training routines – they regularly squat, bench and deadlift using super heavy weights until the cows home. With that in mind, the basic exercises for gaining explosive strength in the overall body are the same for bodybuilders and every other kind of athletes, as well. However, you don’t have to go crazy and move into your gym to get there! All you have to do, literally is lift heavy stuff, eat a solid diet and rest adequately. Yes, that is really all. However, we’d strongly advise you to rely on compound exercises for creating the base of your program, because this category of exercises, which provide maximum muscle fiber recruitment and target many large muscle groups at the same time, allows you to achieve strength goals as fast as possible, but also in the safest way possible as well. Now let’s see which exercises are mandatory for the strength-gaining part of your program! 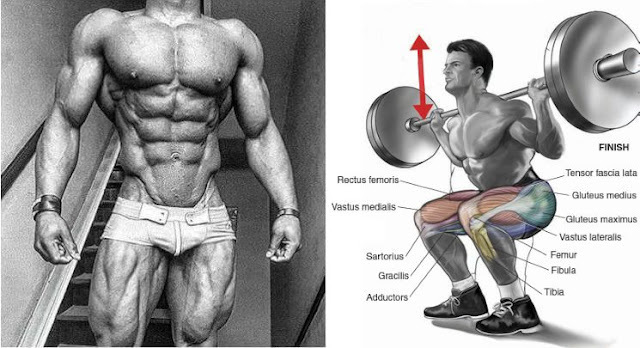 Among many others, the squat engages the largest muscle in the body – the gluteus maximum. Your glutes are the muscles with largest cross-sectional area and can provide the greatest amount of force. When performing squats, you’re primarily targeting the glutes, quads, hams and core muscles, while the upper half of your body gets worked as well. 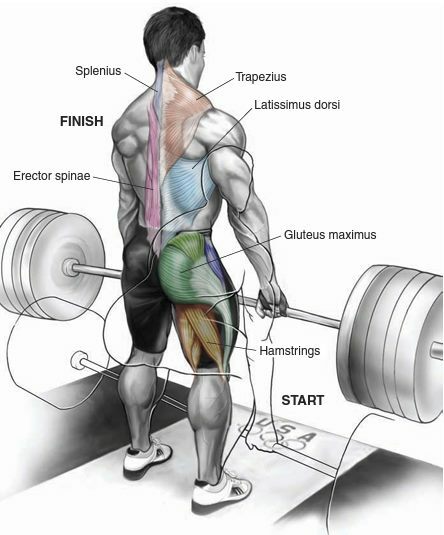 Deadlifts are usually a cornerstone exercise in any dedicated lifter’s workout. Honestly speaking, if you had to pick one exercise to do for the rest of your life – this exercise deserves to be the winner. You can fit it into your back program or perform it on leg day, as it powerfully works the erector spinae, core muscles, quads, hams and glutes. That being said, use slow reps and maximum focus to achieve optimal muscle contraction and fiber recruitment. This full-body move is a crucial one when it comes to maximizing strength (especially explosive strength) gains: if you do it correctly, it will allow you to exhaust everything from the medial head of the calf muscle up to the tri’s and traps. Just like with any other compound movement, it will train your core muscles and improve your trunk strength and stability. 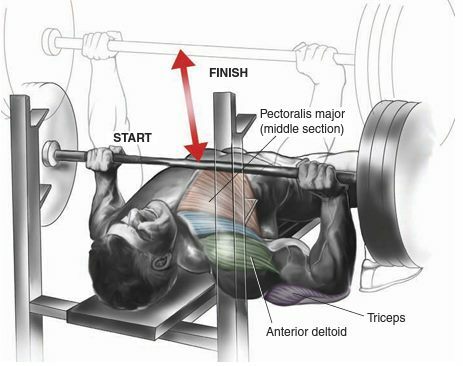 Ah, here comes the king of pressing movements: the regular medium-grip bench press. Although it is usually used to build strength in a localized manner, it is still one of the best compound exercises around. What’s even better, you can use its many, many variants to achieve different unique strength, mass and mobility goals (barbell incline bench press, decline dumbbell bench press, close-grip bench press, etc.). You cannot develop well-rounded, muscular and strong shoulders without regularly pressing weight overhead! This move targets all 3 heads of the deltoids, engages the traps and allows you to “discipline” your core muscles so that they can allow you to maintain strict and proper form during each of these 6 strength training exercises. Ideally, you need to use a weight that can help you reach an optimal level of fatigue after about 6 reps. 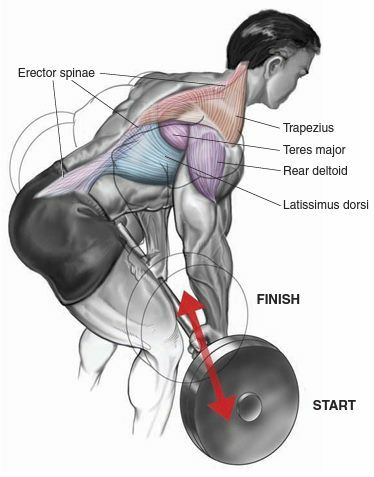 Complete your strength training routine with bent-over row, which primarily targets the rear delts and the latissimus dorsi muscle, while also effectively engaging the transverse abdominus and a plethora of stabilizer muscles (just like most of the exercises above). Make sure to keep your core muscles contracted all throughout the motion in order to prevent causing unwanted stress upon the lumbar spine. The optimum rep range for strength training is 3-6 reps per set. You need to cause an increase in resting metabolic rate, which will then call upon an increase in anabolic hormone production. Great, right? Now, if you are a beginner in weightlifting, you will need to take it a bit slower. Remember, completing multiple heavy, low-rep sets could increase your risk of injury, because your body would be untrained and you’d have a greater chance of compromising your form. So if you’re still in the rookie category, we recommend you to complete 3 full-body sessions a week, incorporating all six exercises described above and performing one set of 12 reps per exercise. This way, your body will have enough time to get used to performing multi-joint movements with good form. As you get better at it, you can start slowly increasing the weight. For strength gains, 3-6 reps are the sweet spot for most lifters. However, since every individual has different body composition and abilities, you should be careful about placing a too great heavy load upon your body, as this can result with undue CNS overload and further health and performance complications. The good news are that you can avoid all of that relatively easily by simply including pyramid setting. Start lighter with higher repetitions, then go up in weight and down in reps from there on each consecutive set. First of all: always warm-up before exercising! Walking into a gym, immediately slapping 45-pound plates on the bar and going as hard as you can doesn’t make you look like an alpha male – but it will definitely leave you vulnerable to injury and might reduce the effectiveness of your workout. So make sure to always properly warm up your muscles by doing a couple of dynamic warm-up sets consisting of lunges, jumping jacks, squats, push-ups, etc. Also – we simply must mention it and you know it – KEEP YOUR FORM PERFECT. If you do these six exercises with lousy form, you are guaranteed to develop bad performance habits and reap a couple of injuries along the way. Leave your ego at the door. You can always add more weight next week – but you cannot magically “jump” back into top shape after you screw up your shoulders or lower back. Okay? Lastly, don’t overdo it. In the world of serious weightlifting, more does not mean better. You really don’t have to slave for hours at the gym every other day, and you most definitely don’t need to do 30 different kinds of back exercises. Just make sure to provide your muscles with enough grow stimulus and keep the intensity optimal – but don’t overdo it to the point where your body doesn’t have enough time to properly rest and grow and you end up doing more harm than good.